Discussion in 'Roller Coaster Construction' started by Jake Martell, Aug 13, 2017.
ok I get it I'll leave! 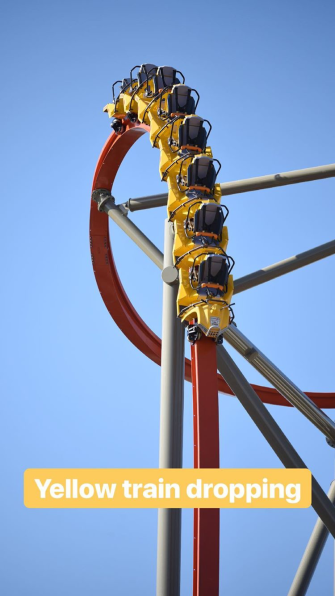 This coaster looks stunning from all angles! And as it's RMC, I'm sure that it will ride stunningly as well! Steel & Story, Matt N, Jaiden M. and 3 others like this. Why are these things so fast! Jaiden M. and Temleh like this. Temleh, Lofty, Matt N and 1 other person like this. I'm sorry but those trains are ing atrocious looking. Color scheme is better than WW, but that is ugly as . The airgates confirm that it won't be a continuous loading station. I love the way the whole area looks! They did a great job tying everything together. I agree! Considering Cedar Fair apparently "don't do theming", I think this looks fantastic! Well done guys! Jaiden M. and Matt N like this. How come it's got wooden catwalks when this is a steel coaster? Jaiden M., Matt N, Pokemaniac and 1 other person like this. Yeah Wonder Woman has steel catwalks so this almost had to be a requested thing. Also doesn’t have them on the first turn like this does. I feel it would look lovely but maybe not with that track color. Wonder Woman has wooden railings on the brake run catwalks, but I've no idea why CGA would extend the catwalks to the first drop. I actually think WW might be better. I suppose so! Gives it that sort of western/road trip type feel they're clearly going for. Thanks, @ATI! Was not aware it had wooden brake catwalks. My inference would be that it’s cheaper for them to buy stock wood and turn it into decking than to fabricate catwalks for that part, but for the more complex lift catwalks it’s more efficient to just fabricate them, then make them wood if the park requests it. Could be several build factors though. Time, material availability, building codes, etc. I’d love to know for sure though! Makes sense to me, if they’re going to stall anywhere it’s on that first turn. Zooming in on the webcam, you can also get a good glimpse of the trains on the transfer. I must say, the color combo is really striking. Pear, Pokemaniac, MakoMania and 2 others like this. More testing footage. Just like Wonder Woman, this thing is lit. Matt N and Coaster Hipster like this.